A friend of mine once called Las Vegas “the Lourdes of America.” People come looking for a miracle, but it’s the casinos that mostly cash in. 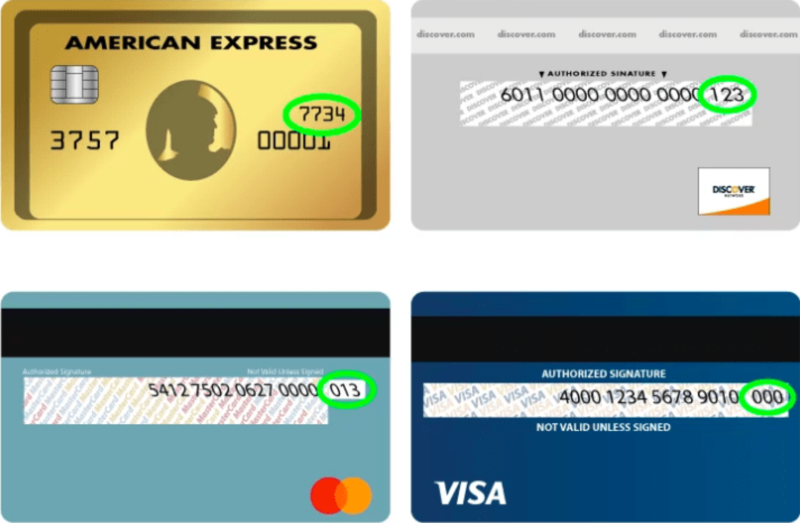 This doesn’t stop the 36 million pilgrims who travel annually to this neon oasis, searching for some indefinable fulfillment, away from home, untethered from their habitual routines and inhibitions, a little off-balance, spending money like the water that is rapidly disappearing in this overbuilt desert. Las Vegas always feels a little like Wall Street on steroids—or is it the other way around? This past Saturday, October 8, more that 1,000 people made this point intentionally or not as they brought the Occupy movement to the Strip. Setting off from the New York New York casino, they voiced a common frustration at the deepening economic inequality in the United States and the increasing financial pain in their city, where the home foreclosure calamity grows daily. This demonstration, like those spreading across America in over 1,300 cities, sharpened one facet of the crisis we face today. Two protests the next morning highlighted another one. 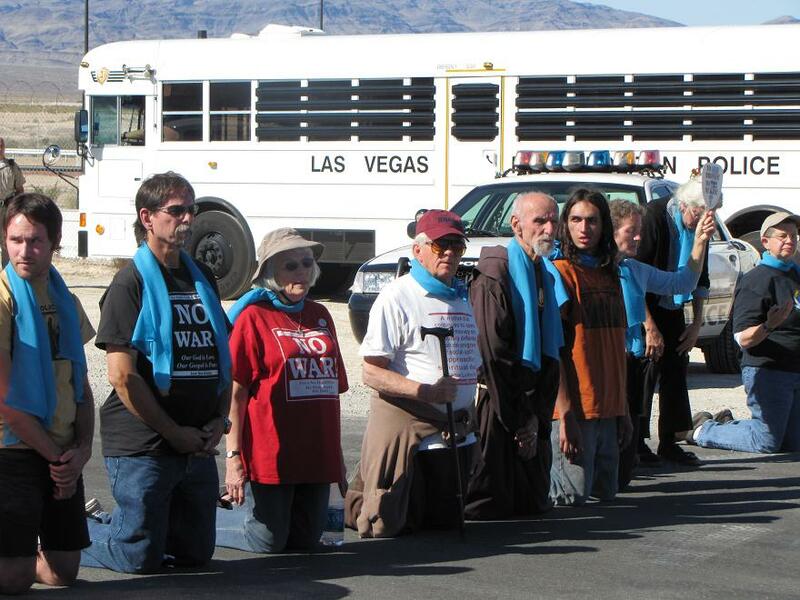 Peace and justice advocates caravanned north from Las Vegas along Interstate 95 on Sunday, October 9 to take action together at the Nevada National Security Site (formerly the Nevada Test Site) and Creech Air Force Base, which operates drone aircraft being used around the world. Members of the Nevada Desert Experience, Code Pink, and the Catholic Worker movement who had traveled from 26 states dropped in on these two high security sites to protest ten years of war in Afghanistan, a runaway military establishment, and a rapidly multiplying drone fleet. These actions played an important role in creating the political conditions for the passage of the Comprehensive Test Ban Treaty, which most nations have signed. (While the US has never signed this treaty, it has maintained a moratorium on conducting a nuclear test that goes to “full criticality.”) However, the newly renamed site continues to “support the country’s nuclear weapons programs, has a mandate to restart full-scale nuclear bomb tests within two years if so ordered by the President, and receives and stores radioactive waste on land that belongs to the Western Shoshone Nation,” as Nevada Desert Experience coordinator Jim Haber reports. On Sunday, after an interfaith service at the entrance to the Nevada National Security Site, 59 women and men crossed into this top-secret facility and were arrested and cited by Nye County Sheriffs. After they were released, many of them traveled some thirty miles to Creech, where 18 were arrested by Clark County police. “It is a thing of great beauty to see people peacefully blocking the entrance to the Creech Air Force Base, speaking a quiet but thundering ‘NO!’ to the drones delivering death around the world,” my Pace e Bene Nonviolence Service colleague Peter Ediger said, reflecting on his experience at the protest. Over the past few years a growing series of nonviolent civil disobedience actions have taken place at Creech, which is the headquarters of the USAF’s 432nd Air Wing of Predator and Reaper drones that operates armed remotely piloted aircraft in Pakistan, Afghanistan, Iraq, Yemen, and elsewhere. With growing public awareness of both drone attacks and the next generation of drones that are being designed, tested and deployed—including one the size of a hummingbird—there is also beginning to be a bit more media coverage of drone protests. Sunday’s witness garnered coverage PBS’s News Hour, the Las Vegas Review-Journal, KTNV television in Las Vegas, and Fox News, also in Las Vegas. The Occupiers in Las Vegas and all over the country stand in a venerable tradition of “occupations,” including the innumerable nonviolent occupations by peace activists of the Nevada Test Site since the early 1980s. Like many of the new occupiers, those who have taken action in the Nevada desert over the past three decades have also called for a reordering of economic priorities that privilege military spending and give short shrift to human needs. 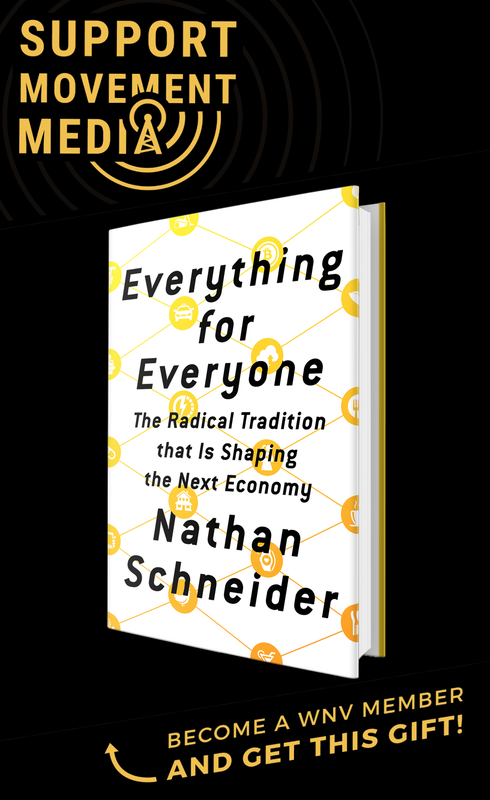 But an even more fundamental value that ties this long-time tradition to the emerging movement against financial inequality is the adamant commitment to the infinite worth of every human being. If that infinite worth is ignored, threatened, or attacked (because of the economic injustice of unemployment, the increasingly technologized terror that modern war and weapons represents, or the inextricable connection between the two, where a martial society means money for war and not for the things that make for life) then determined and compassionate action must follow. Such action will include challenging Wall Street’s gambling addiction—with its roulette tables and slot machines where only a few of us win—and the national security state where the stakes are even higher. This will be a long and arduous process, and will take nothing less than a thoroughgoing transformation, within and without. But, like those crossing the line at Creech—and those finding their new “occupations”—each of us can embark on this powerful and demanding pilgrimage of deep and fundamental change. What exactly is wrong with UAVs? If anything, these tools make warfare more humane utilizing state of the art sensor packages and precision guided munitions reducing collateral damage casualties. If it is an antiwar message you’d like to convey, protesting remote military installations is probably not the most effective method. Perhaps a smarter move would entail working to get politicians elected who share your world view. Using the money paid in trespassing/legal fees would be better utilized in political speech. False. Drone attacks, contrary to state and business propaganda about how these things are “precise” or “humane,” are very sloppy. So much for being precise, eh? As for humane, well, the argument only applies if you also consider grenades or explosives humane, since they have the same effect of blowing your body to bits. You can ask the hundreds of innocent people who have been affected by these drone attacks. Also, having to have to live with the fear of being killed by a potential drone attack is plain terror. You try sleeping with the fearful unrest from the possibility of having yourself or your friends and family being killed in at any moment. It’s a question of accountability. A soldier who’s not part of the battlefield would have less of a reason to feel morally responsible for their actions than one that was actually there on the mission. So if you’re fighting a useless or wasteful war, it may take you longer to realize it and react to it if you’re sitting in a UAV control room on the other side of the world. Also, weapons that make warfare too easy are no good if you imagine your enemies getting a hold of the same kind of weapons. Would Russia and China stay on the same side as the USA forever? Idea to bring down drones: Catch the Ku-band datastream from the drone and retransmit it at 100 Watts after a delay or/and repeatedly to the receiving satellite to confuse the operator.